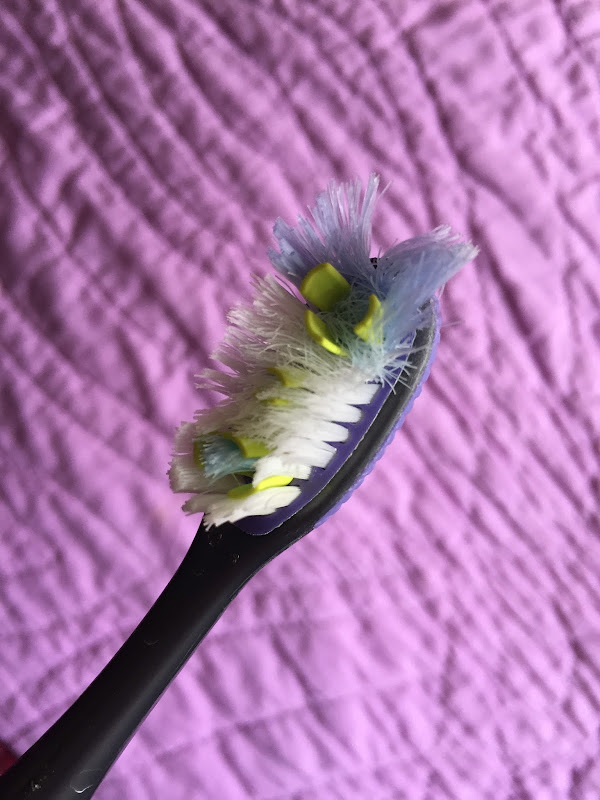 it's time for a new toothbrush. i bought this one last november when i arrived in sioux falls without my luggage. after 15 hours on various flights, i was desperate to brush my teeth and insisted that my sister stop at a drugstore so i could get a toothbrush and toothpaste before we went to the hospital to see dad, who lay dying at the hospital. and somehow, this toothbrush has gotten bound together with dad in my mind and i can't bear to replace it. it's funny how that happens, how an ordinary object takes on a magnified significance in your mind. i read a guardian piece yesterday about the significance of words when someone dies and i've been thinking about it ever since. i realize that i felt the opposite of author gary nunn about those words of condolence that people offered. the distancing phrases like "passing away" infuriated me, causing a slow boil inside that i had to keep bottled up. and everyone's need to say something or express how sorry they were also filled me with a rage that i had to stifle. i understand fully that people feel they need to say something, but losing dad felt like something that was mine and my mother's and my sister's and that no one could possibly understand it or be as sorry about it as we were. it felt private and solitary and so profoundly singular that no one else should have the right to say anything. i wanted to scream that at them and i wanted to run away from all those empty words that weren't going to bring him back. and i guess in a way that i did run away from it, flying to london, determined to finish a project that i'd worked on for months. i don't regret doing that because it's the one gut feeling i had in the whole experience - that dad would think it was the right thing to do. but looking back, i think i was escaping all of those well-meaning but empty words of condolence. i wasn't able, at that time, to share dad's death with others. while i was there, we had a storytelling evening, where well over a hundred people came to have a beer and share their stories about dad. it was that evening that i realized, to an extent, that i did share his death with the whole community and when it really hit me how important he had been to so many people. but i wasn't ready to share it yet then and i'm not even sure that i am now. just last night, i woke up from a nightmare in which that horrible picture of him with a shirt and tie that didn't match at all was blown up poster size and displayed at the funeral. my dad, who was fired from his sports reporter job for refusing to wear a tie, immortalized with an awful tie on in that awful photograph. it still haunts me, even tho' we were able to get it switched out quickly in reality. i guess i'm having a hard time getting over it, just as it's hard to get over dad's death. i think of him a lot as we're working in the garden. and i don't go around crying, it's more of an internal conversation with him that i have as i'm weeding or picking asparagus. i know he'd love to see our asparagus, it's finally doing well and there's enough for some for our meal almost every night. he would like that we have asparagus in the garden and i'd love to be able to talk to him about how our sandy soil and the right amount of horse poo seem to be perfect for growing asparagus. i think he'd also be impressed with our rhubarb. it's pretty shockingly prolific. he'd also get a big kick out of the way that our little molly cat loves to "help" out when i'm in the garden. it makes me smile to think of that. it feels like thinking of him in the garden helps the healing. but i'm just not ready to let go of that toothbrush. so, i'm keeping it for now. Hang on to that toothbrush as long as you need. I imagine your Dad would like that story too.